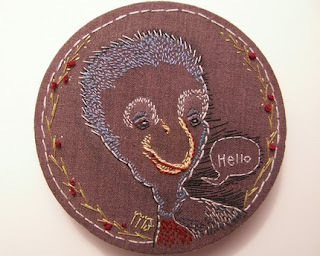 feeling stitchy: I just stitched to say "Hello"
I found Melissa on etsy who made some unique "Hello" embroidery. 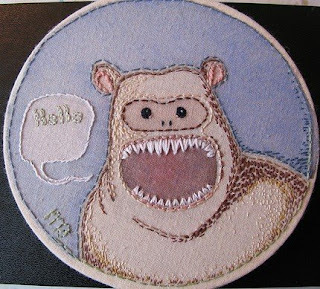 She uses watercolor to enhance the muslin that she embroiders on. I would suggest an acrylic wash would be more permanent and especially if you ironed it after it dried. I love her "Hello Critter" as she calls him. The little seed stitches give it a nice dimension and texture. Melissa also does some wonderful watercolors and plush creatures of her own design. These little stitcheries inspired me to think of a past post on Feeling Stitchy about leaving little embroideries in public places for others to discover. I couldn't find the post, so if you do, will you leave a link in comments? Wouldn't that make your day should you discover one of these little hooped stitcheries in some unexpected place? She really adds great texture. Just enough, not too much. Fantastic work. Thanks for sharing. Wow these are really inspiring! I love her stitch choices for texture and the animals are really cute! Those are beautiful. 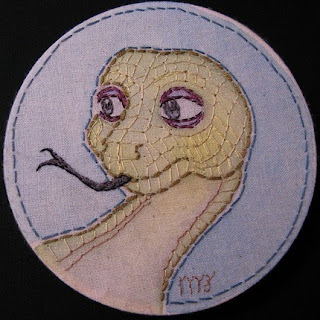 I especially love the girl and the snake -- the stitching on the snakes gives a great "scale-y" texture. i love her work, i've been lusting over it for a while now! it's so lovely to see it here! Wow! They are fabulous and painting a was of colour really enhances them. These ar beautiful although the content of some are a little spooky! The more I see that Hello critter, the more I am convinced I must make it mine. If you like this you should totally check out some of her other stuff, Melissa has amazing ideas and makes them come to life in the most unexpected ways! I have one at home and love it! ooh i love these! 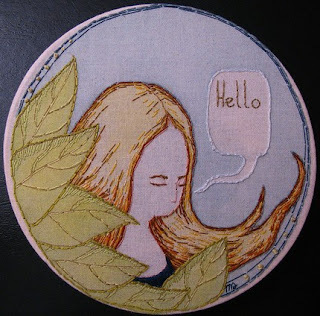 i never thought of adding watercolour to embroidery, it works so well. The texture is just sweet-as-a-nut. oh wow these are amazing! I just love the first one. What a wonderful idea. These are wonderful. I've recently begun watercoloring my fabric so thanks for the tip on acrylic washing too. These are just beautiful - I *LOVE* the painted muslin. So creative!!! wow those are amazing, thanks for finding them.